Too many of us are still in debt. Banks offer some relief, but only if we're willing to risk adding to our plastic arsenals in the form of a balance transfer card. Unlike cash-back cards that pay you to spend, this particular type of credit card offers generous up-front terms such as 0% interest in exchange for transferring large balances. Stay disciplined and aggressively pay what you owe, and you could save hundreds or even thousands of dollars in interest charges with one of these cards. Get lazy, and you could end up paying even more than if you had stuck with your original creditor. Moving balances isn't much different from switching cable TV providers or deciding on a new phone company. Banks offer the service because it brings in customers while simultaneously sticking it to rivals. Transfer a balance, the thinking goes, and you're more likely to hang around and sign up for other services. And the longer you stick around, the more likely it is you'll get cozy and forget to pay off all the money you transferred, kicking off big interest charges. Consider Visa's (V) Black Card, which is marketed by Barclays (BCS) and deemed one of the five worst cards of 2011 by CardRatings. Transfer a balance and you'll get 15 months of 0% interest, but you'll also pay 3% on every transfer -- or $30 for every $1,000 moved. And that's on top of $495 in annual fees just for the (ahem) privilege of having this card in your wallet. The best balance transfer cards combine low fees and extended time for working off debt at cheap rates. Does Discover Financial's (DFS) More Card measure up? That's the question before us today in this ongoing series examining the best (and worst) credit card offers out there. 1. Up to 5% cash back. Each quarter, Discover offers those who sign up for its program the chance to earn up to 5% cash back on purchases. Categories rotate quarterly, with "gas and entertainment" currently in favor, according to the card's terms and conditions. 2. Fee-free balance transfers though the summer. Most balance transfer deals include a fee charged that's a percentage of the transferred balance. Not here. 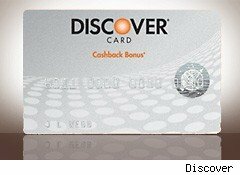 Discover is waiving fees on balances transferred to the More Card as long as they post by Aug. 10, 2012, and that's on top of 12 months of 0% interest. 3. No annual fees. The More Card also carries no annual fee, a good deal considering the perks. Just remember that Discover wouldn't make this offer if history didn't suggest that many who apply tend to get lazy while enjoying 0% interest, only to pay double-digit rates on the back end. And there are downsides. As with the Chase Freedom Card, cash-back earning is capped at $1,500 in qualified purchases quarterly, and that doesn't include spending at big-box warehouse clubs. Apply for this card if your aim is to pay off a manageable amount of debt within 12 months. You'll want to run the numbers, though. Transfer more than you can handle and you'll waste the benefits of the More Card's zero-fee, 0% interest offer. Let's say you transfer $10,000. In doing so, you are committing to paying $834 a month to reduce your debt. You do well for four months but then expenses force you to cut to just $500 a month. By the end of the 12-month period, you'll have $2,664 still subject to at least 10.99% interest -- or $24.40 a month and $293 annually. Yet more hundreds wasted. But that's only for the careless. For those who pay off everything during the grace period, the More Card appears to offer exactly the sort of low-cost deal we should be looking for in a balance transfer card. Just go in knowing that the terms and conditions strongly suggest Discover makes its money on interest rather than fees, which means the bank is betting you'll slip up. Don't take the bait. Make a plan to transfer a reasonable balance, budget for the payments, and then chip away until you're done. Motley Fool contributor Tim Beyers didn't own shares in any of the companies mentioned in this article at the time of publication. Check out Tim's portfolio holdings and past columns. Motley Fool newsletter services have recommended buying shares of Visa.